This prestigious building consists of offices of various size, fully furnished to a high standard and decorated with great attention to details. 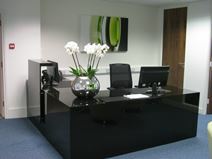 These offices benefit from a wide range of services and facilities and from a reception area managed by a professional and qualified staff providing secretarial and support services. The building is surrounded by shops, restaurants and cafes, perfect for time away from the office. A stylish, extensively glazed contemporary building with adaptable offices and a host of benefits such as its own internet café, cutting-edge IT facilities, kitchen area, showers and full reception and conference facilities. Situated in the old part of Reigate town near to the castle, it is a minutes’ from the rail station and not far from the M25. This space is accessible 24-hours a day, which is great for flexibility.